The Bevel Line collection is now rebranded as Expona Bevel Line and featuring new contemporary wood and stone effect designs. The new Expona Bevel Line PUR range includes a total of 27 designs which incorporate the latest architectural trends and are ideal for heavy footfall commercial interiors. Key design features such as colour variation, pattern formations and complementary surface textures help Expona Bevel Line beautifully replicate natural flooring materials and achieve a high specification finish. Designs in the wood collection feature intricate details and unique characteristics that you would expect to see in real timber flooring, including on-trend grey toned woods and rustic elements which are becoming more popular for commercial interior projects. With both slim plank and wide format designs available, Polyflor have also added Enriched Variety Oak and Boardwalk Variety Oak to the collection, which include a mixture of different sized planks within each box to create the look of a recycled wood floor. Sophisticated marble effects and weathered stone designs have also been added to the collection, with square and oblong tiles as well as long, slim plank styles on offer. The Expona Bevel Line collection has a 2.5mm gauge, 0.55mm wear layer and features a bevel around the edge of each plank and tile for extra definition when laid. 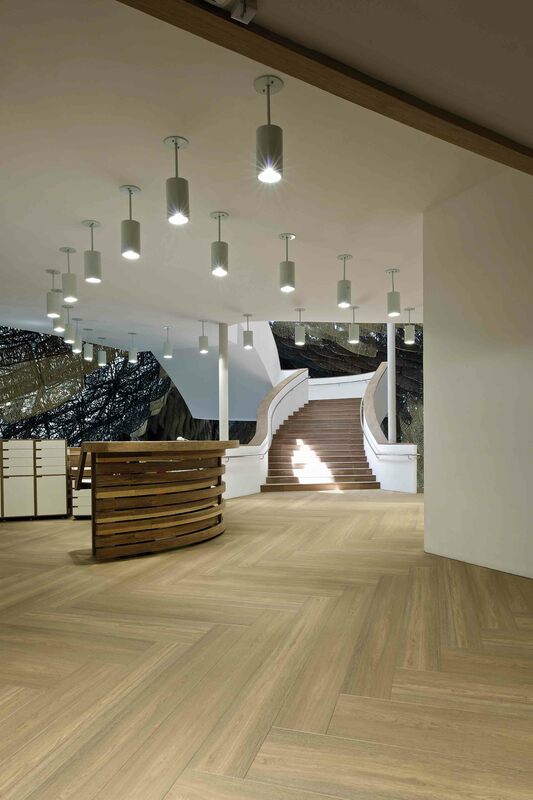 Expona Bevel Line LVT can also be used with a variety of inlay strips for further creative layout possibilities. These luxury vinyl tiles are enhanced with Polyflor PUR, Polyflor’s exclusive and robust polyurethane reinforcement which is cross linked and UV cured to provide superior cleaning benefits and a cost effective maintenance regime. The new Expona Bevel Line collection is showcased within a 48-page brochure and shadecard. Sampling can be ordered free of charge on the Polyflor website or by calling the Polyflor Samples Direct Hotline on 0161 767 2551. Expona Bevel Line’s environmental credentials are impressive, achieving a BRE A+ rating in major use areas and Indoor Air Comfort Gold, assuring that VOC emissions are below any globally determined levels. Expona Bevel Line is 100% recyclable via the Recofloor recycling scheme and also contains an average of 40% recycled content.